The main decision to be made when deciding how to support your yard fence is whether to use wooden or concrete posts. There are of course benefits and drawbacks to both and it is entirely your choice which to use. Here we have laid out some positives and negatives of each. Wooden fence posts are definitely cheaper than concrete posts and they are simpler to install. When used with metal met posts (the spikes which are driven into the ground for the posts to sit in) they are strong and robust and can be driven into the ground simply and quickly. Many people also say that they give a warmer look and feel to a garden but of course that’s down to your personal taste. On the negative side, wooden fence posts may not last as long as concrete posts as they are subject to damage by water and the sun. However, of course if you treat your wooden fence panels with a good quality wood protection like those available from Owatrol, they would last much longer! Concrete fence posts are more expensive than wooden fence posts and will require considerably more time to install, with holes needing to be dug and the posts concreted in. However, they will certainly provide a stronger, and arguably more long-lasting structure to your fence. Concrete posts will not decay or rot over time so will potentially last longer (especially than untreated wooden posts) but of course if one is damaged it is much more difficult to replace as you would need to dig up the concrete and begin again. You can see that there are both positive and negative aspects to both types of fence support and often in the end, it does partly come down to what you want your fence to look like when it’s complete. 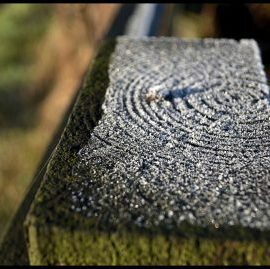 If cost is your main concern then it would seem sensible to go for wooden posts but be mindful that you need to use a good quality wood protection product on them to prevent damage and keep on top of any maintenance required. For an incredibly strong structure, use concrete posts but be aware you will need to spend more on them and they will be more difficult to install – but with less ongoing maintenance. In our next post in this series, we will be exploring how to install your fence posts – whichever type you decide one!